Close to Mykonos, the island of Delos is a haven of peace and tranquility far from the festive atmosphere of its neighbour. If in ancient times the island of Delos was the economic and religious centre of Greece, then today it is an archaeological site that is incredibly well preserved. Take a trip back in time to the island of Delos, a jewel of the Cyclades that will not stop surprising you. The island of Delos is a small rock lost in the middle of the charismatic Mediterranean Sea. This deserted island is today a secret place filled with legends. The first inhabitants of the island would have landed in 3000 BC, then populating this Cycladic treasure. According to Greek mythology, Zeus seduced the goddess Leto, who fell pregnant. Hera, Zeus's wife, threatened the adulterous couple. Zeus asked for help from Poseidon who, with a trident stroke, showed two rocks on the Mediterranean Sea: Delos and Rhenea, so that Leto could hide there. With the help of the goddesses Ilithia and Iris, Leto gave birth to his child on the sacred island of Delos. Thus Apollo and Artemis, two twins, were born at Delos. Since then, Delos has become the cradle of the Greek gods. If you are passionate about Greek mythology or simply curious, this island full of mysteries will seduce you for sure. Thanks to the legends around Delos, this small island has become the religious and economic center of Ancient Greece. Considered sacred, the island received many gifts, such as the picturesque terrace of lions, where you can admire the remains if you visit this treasure of the Cyclades. Greece then passed under Roman rule, which turned Delos into a real nerve center for economic activities. Merchants and bankers crowded there. The island was at its peak thanks to the lucrative trade of wheat and slaves. With its international influence, the island of Delos gradually attracted foreigners who decided to put their bags down on this treasure of the Cyclades. Since then, one can see in Delos the Terrace of the Foreign Gods, a testimony of the golden age of this Greek island. 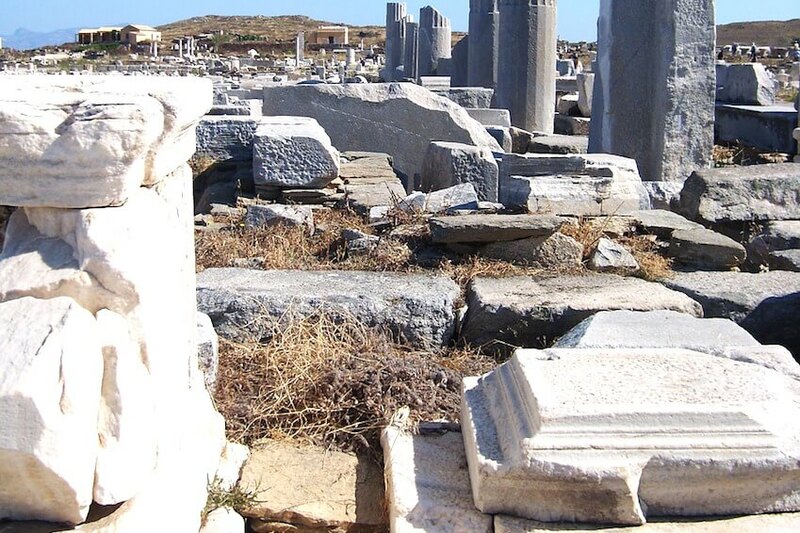 In the eleventh century AD, during the mithridatic wars, Delos was destroyed and deserted. This was the decline of this divine cradle of the Cyclades. Yet the island has remained intact throughout the ages. A true testimony to the ancient Greek and Roman heritage, the island of Delos is a boon for all archaeologists and the curious. Do not wait and discover the remains of this legendary island! The island of Delos is a tiny rock of 3.5 km2 that will bring you all the peace and tranquility you have always dreamed of. Close to the famous Mykonos, these two islands are however entire opposites. If Mykonos is famous for its festive atmosphere, the island of Delos is now largely uninhabited. This haven of peace is a real treasure for all travellers who wish to flee mass tourism. Very bright, the island of Delos will offer you a real journey in time. Forget the worries of everyday life and enter the lair of the Greek Gods. Through the remains left by civilizations, you can free your imagination and recreate Delos in antiquity. These traces of history are rare treasures that will inevitably make your trip memorable. The remains of Delos provide an incredible testimony to the cosmopolitan Mediterranean port that the island once was. A UNESCO World Heritage Site since 1990, this jewel of the Cyclades will delight all lovers of archeology and history buffs. 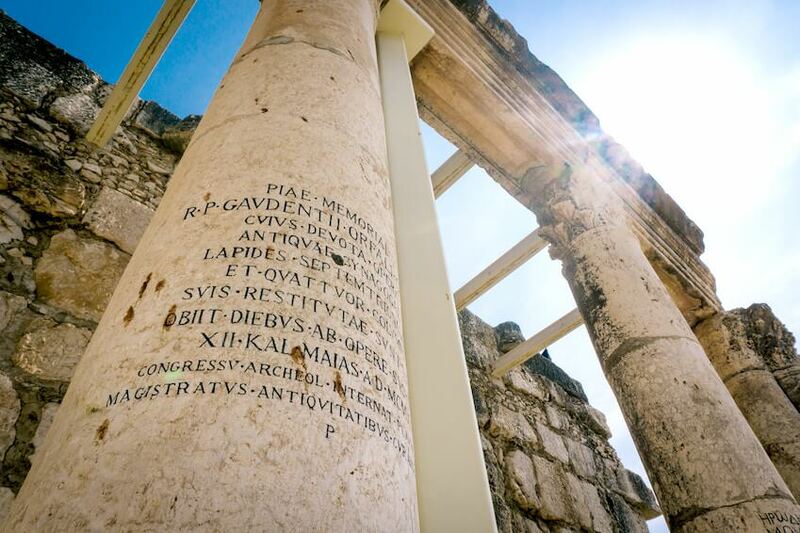 Upon your arrival on the site, you will be dazzled by the sanctuary of Apollo, erected in honour of the Greek God who, according to legend, was born on the island. During your visit, stop and admire the famous Lion Terrace. These marble lions of Paros, formerly numbered 16, served to protect the site from any outside invasion. Today there are only 5 lions left, however they remain a symbol in Delos. Continue your trip to the theatre district, towards Mont Cynthe. It was once the most exclusive district of the island. In the heart of this exclusive neighbourhood, you can contemplate the remains of sumptuous homes that once belonged to famous figures of Greek mythology such as Cleopatra or Dionysus. North of the theatre district, enjoy a visit to the Museum of Archeology. Ideal for family holidays, this museum is one of the most important in all of Greece. A large majority of the remains of Delos are in this exceptional monument: jewels, ceramics, statues or vases, there is plenty to discover! If you want to do some sport during your holidays, climb Mount Cynthe. This mountain is the highest hill on the island of Delos. From above, you will enjoy a spectacular view of Delos and Rhénée. Finally, during your getaway to Delos, do not miss the temple dedicated to Isis, goddess of sailors. This vestige is of a breathtaking beauty. Right next to the port, you will find the temple of Dionysus which will attract your curiosity because of its particular shape. We will let you discover more for yourself! Delos was a strategic site in the era of Greco-Roman antiquity. Therefore, the remains that you will observe during your visit are testimonies of the immense influence that Delos had on art and architecture. The immense Hellenistic sanctuary dedicated to Apollo is also irrefutable proof. 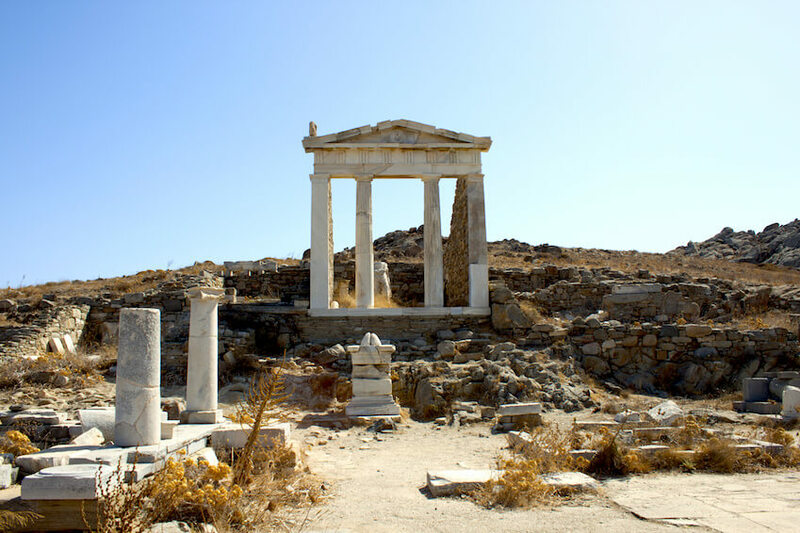 If you want to go back in time and try to trace the history, the island of Delos is undoubtedly a destination for you! Through the incredibly well preserved remains of this Cycladic island, you will be able to reinvent the Greco-Roman era. This getaway will forever change your outlook on the world. Far from the decadence of Mykonos, Delos is a haven of peace and tranquility where it is great for walks. As the island was deserted after its decline during the mithridatic wars, Delos was designated as an entire archaeological site. All remains that you can admire are incredibly well preserved despite the wind that often blows on this region of Greece. In addition, the site has preserved, throughout the ages, a rare authenticity. Indeed, restoration work was carried out for the sole purpose of preserving the monuments as much as possible. No modification has been made to this island, which for the moment remains uninhabited. That is why, fifteen centuries later, the landscape of Delos remains unchanged. Cross the story and discover authentic Greece by visiting the jewel of Delos. After your relaxing escapade in Delos, go and experience the festive atmosphere of Mykonos. This island of all possibilities has a myriad of paradisiacal beaches with fine sand. Perfect for sunbathing! Party-goers will then be able to dance until the end of the night in the numerous bars and discotheques of Mykonos. 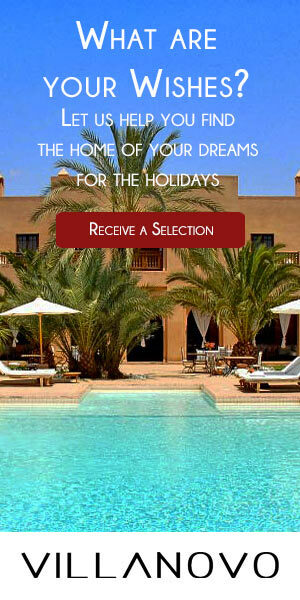 It’s an unmissable opportunity to discover another side of the Cyclades!